The wide, panoramic format of this work is unusual in Renoir's works. This is one of the first of his scenes of contemporary urban life, of which he executed others during that year in the company of Monet. The work was painted in the year of the Exposition Universelle, which brought thousands of visitors to Paris to see the pavilions set out on the Champs de Mars and which the government hoped would demonstrate the industrial and cultural pre-eminence of France. 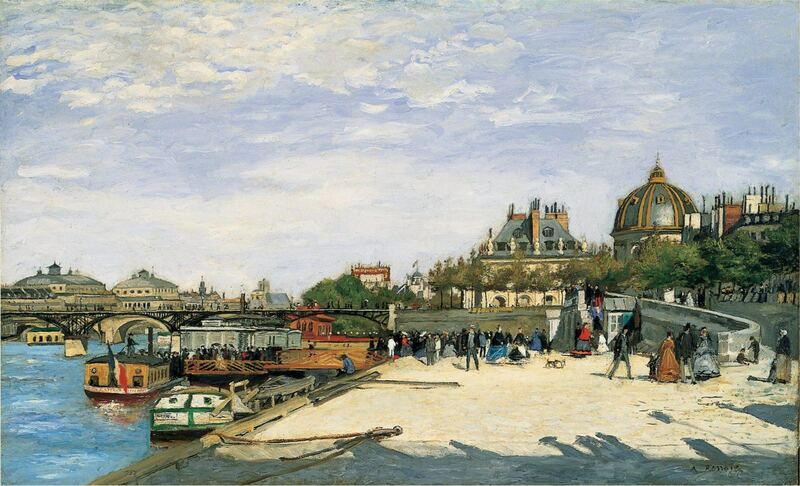 Renoir's picture shows the dome of the Institut de France on the right and the Pont des Arts arching across the Seine on the left. The whole scene is one of lightness and space, made possible by Renoir's choice of site: the Quai Malaquais, which dominates the work, had recently been widened by Haussmann. In the immediate foreground can be seen the shadows of the pedestrians on the Pont du Carrousel overhead, while in the middle we see a river cruiser disgorging its passengers onto the quay. Other figures are scattered along the bridge itself. The picture incorporates a mixture of social types: a working class woman with her children on the right, imperial guardsmen (in their bright red trousers) at the top of the steps leading to the bridge, and fashionably dressed residents and tourists scattered elsewhere. It is precisely this sort of bright, airy image, alive with activity and rendered with an objective eye, that was so characteristic of Impressionism, marking it off from earlier artistic schools. Copyright © 2015-Present www.Impressionists.org. All Rights Reserved.